Holders Esperance of Tunisia completed a double over Algeria's CS Constantine on Saturday to reach the semi-finals of the African Champions League. The defending champions followed up an away victory last weekend by winning the second leg of their quarter-final 3-1 in Rades for a 6-3 aggregate triumph. Saad Bguir, whose two goals against Al Ahly won Esperance the 2018 final, scored twice in four minutes during the first half to ensure there would be no dramatic Constantine comeback. Esperance will meet TP Mazembe of the Democratic Republic of Congo in the last four. 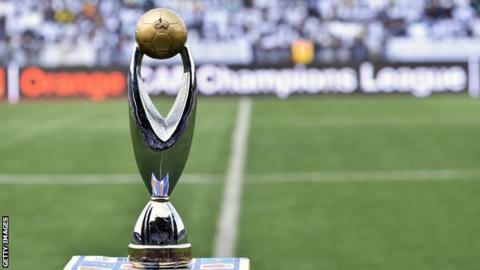 Mazembe survived an early scare to beat Tanzania's Simba 4-1 and become the first team to reach this season's Champions League semi-finals. The first leg of their quarter-final in Dar es Salaam finished 0-0 when Simba missed a penalty, but on Saturday, the Tanzanians were the first team to score. Ugandan Emmanuel Okwi stunned the Lubumbashi crowd with a second minute strike to put the visitors 1-0 up. But Mazembe, five times former African champions, fought back thanks to an equaliser from Kabaso Chongo of Zambia in the 23rd minute and then an Elia Meschak goal 15 minutes later. The hosts went into the break 2-1 up and made sure of the victory with two second-half goals from Tresor Mputu and Jackson Muleka - two players who, before Saturday's game, had scored four goals each in qualifying and group matches in this season's Champions League. Later on Saturday, record eight-times former winners Al Ahly of Egypt beat Mamelodi Sundowns of South Africa 1-0 in Alexandria, but it was not enough for the Egyptian giants to overturn their 5-0 mauling by Sundowns in the first leg last weekend. Ahly secured their second leg victory thanks to a goal from Moroccan Walid Azarou in the 68th minute. Ugandan goalkeeper Denis Onyango starred for Sundowns, making a string of brave saves, especially in the second half when Ahly laid siege to his goalmouth. Despite a crowd of around 30,000 there was no miraculous comeback for the Egyptian side and it is Mamelodi Sundowns who advance to a semi-final against Wydad Casablanca. Wydad overwhelmed Horoya AC of Guinea 5-0 in Morocco after a goalless first leg with Walid el Karti scoring twice within 10 minutes during the first half to trigger the rout. Mohamed Nahiri netted in the second half to raise his African club competition goal tally for the season to five. The semi-final first legs will take place on 26 April 2019.